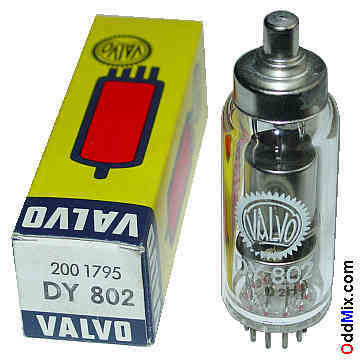 This is a genuine, rare, vintage, discontinued, rare, historical, European type DY802 High Voltage Diode Vacuum Rectifier Half-Wave electron tube. This tube is used for high-voltage low-current half-wave vacuum pulse rectifier applications. Excellent collectible and for antique radio or television restoration projects, experimentation with high voltage and X-Rays or to set up a private vacuum tube museum. This tube is capable to work with voltages as high as 20 kVdc plus! It is a NOS tube [New Old Stock], unused, boxed, good condition.